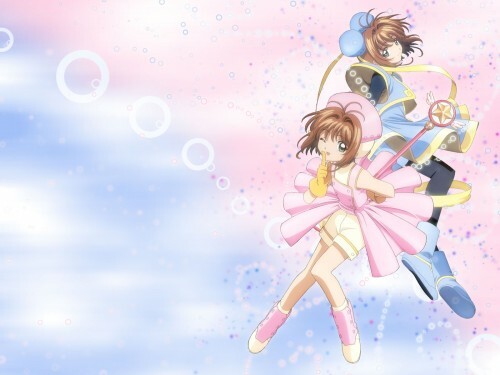 Sakura is featured here twice in pink and blue. Why all the light colors you ask? i DONT KNOW!! Ive gone girly. Photoshop 7 + Tons of new Brush settings + New amazing effort to remain non eyesorish. I like it. But Maybe you could have done more with the bg... But this one fits too. Maybe it's better than any complicated bg, dunno. Good one. I'm not a really girly person but I think this is nice. Well, CCS is all about 'lightness' so I don't think it's anything wrong to use light colours. Anyway, it's a really nice wallpaper here. I like it. great wallpaper! great how you blended in the background so nicely with the character. keep up the good work! It really SHOULD be light and soft. Mice mixture! and choice of colors!